Who is suitable for dentures? How can you care for your dentures? Are you missing any teeth? Dentures are often the most affordable option for replacing missing teeth and restoring your smile. Find out more about dentures by arranging a consultation at North Queensland Family Dental. Call us on 07 4755 2055 or book an appointment online. Dentures are replacements for missing teeth that may have become lost or damaged. Modern dentures are designed to look as close to real teeth as possible, although it can take some time to get used to eating and speaking with your new dentures. 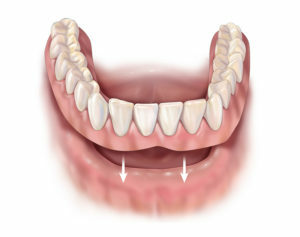 Full or complete dentures replace a whole arch of teeth (upper or lower row). They’re used when all or most of the teeth in an arch are missing. The replacement teeth are attached to an acrylic base that fits over the roof of your mouth (upper dentures) or your lower gum (lower dentures). If you only need to replace one or a few teeth, or you still have some healthy teeth that you want to keep, we can replace the missing teeth with partial dentures. These dentures include one or more teeth in a row, attached to a gum-coloured plastic base. This may be supported by the neighbouring healthy teeth or by an implant. If you want a more permanent replacement for your tooth, you may choose to secure your dentures with implants. These are metal posts that are implanted in your jaw where missing tooth roots used to be. The advantage of implants is that your dentures will feel and function more like natural teeth. The implant will also stimulate bone growth in your jaw, helping to prevent it from shrinking. If you prefer to avoid the cost and surgery involved in implants, you can choose traditional removable dentures. Full dentures can be secured by suction, while partial dentures can be attached to the surrounding teeth to keep them in place. Removable dentures should be removed at night or when you take part in activities that could cause them to be damaged. You’ll also need to be more careful about what you eat, to prevent your dentures being damaged or coming loose. Missing teeth can put your mouth at greater risk of oral health problems and might make it more difficult to eat or speak. The healthy teeth in your mouth may also start to move and become crooked when they don’t have support. Dentures are one of several treatments we offer to replace missing teeth at our Townsville clinic. You may be suitable for dentures even if you’re not eligible for other tooth replacement options such as dental implants or a bridge. We’ll always try to save healthy teeth whenever possible, so we’ll recommend partial dentures if you still have a number of teeth remaining. However, if your teeth are badly damaged or decayed and are putting your oral health at risk, we may recommend having them extracted and replaced with full dentures. If you decide to have dentures, we’ll talk you through the process and make sure you have all the information you need. 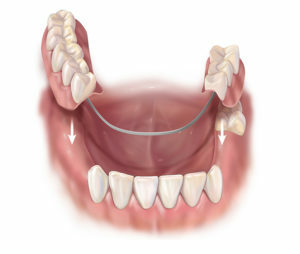 Creating and fitting dentures usually requires several appointments. We’ll first assess your oral health to check if there are any problems that need to be treated first, such as gum disease. Then we’ll take impressions of your mouth that we can use to design your new dentures. We may show you a range of options which you can choose from, explaining the pros and cons of each. When your dentures are ready, we’ll give you the chance to try them out and to tell us any changes that need to be made. 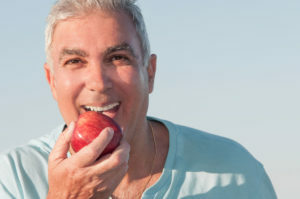 When you’re happy with your dentures, you can resume your normal activities, following our advice about certain foods to avoid. If you need to have any teeth extracted, you’ll need to wait for your mouth to heal before your dentures can be cast and fitted. We can provide you with temporary dentures to wear during this time. We’ll give you instructions on how to look after your dentures to help them stay in good condition. It’s important that you continue to follow good oral hygiene to keep your dentures and your mouth clean and free from food and bacteria. We can provide you with a denture cleaner and a container to store your dentures safely overnight and when they’re not in use. We’ll check the condition of your dentures during your regular dental check-ups. We can also perform denture repairs or relines if your dentures get damaged or come loose. You should not try to repair dentures yourself. It usually takes a while for patients to get used to the feel of their dentures, but your mouth should adjust over the course of a few weeks. If your dentures still feel uncomfortable after this time, or you’re having other problems, make an emergency appointment at our clinic. During your consultation at North Queensland Family Dental, we’ll also tell you about our other tooth replacement options. Dental implants and bridges cost more than dentures, but they could be a more suitable long-term option for replacing one or several missing teeth.